Product: Top Dog Health – The Ultimate Support Harness For Dogs – T.U.S.H. If your are looking for a dog lift harness, this is the harness for you and your dog. A dog lifting harness can be necessary for many different reasons. In this dog lift harness review, I am going to discuss why I have chosen this lift harness for dogs, compare it with dog rear lift harnesses and talk about who this harness works great for. Dogs that are having problems walking, can really benefit from having some type of lift harness. I currently have a dog that is having problems walking and needs assistance, so finding the best harness to support my dog was of upmost importance for me. It has led me to hours of research, making sure I find what will work best. Let’s take a look at the Top Dog Health Support Harness also known as T.U.S.H. This dog lifting harness is not what I was originally looking for, but I realized that it provided the best support for my dog and was the safest harness to use to keep my dog safe. The Top Dog Health Harness was created by a veterinarian who has an understanding of where your dog needs support. So not only is it vet approved, it was a vet creating and developing the best dog lifting harness. There is a long strap that attaches to front of harness and back that is adjustable, to help avoid having to bend over to hold your dog up. Additional handles on front and back make it easy to help your dog get up from the floor, up or down stairs, or into a vehicle. As you can see from the picture above, this dog lift harness has support for both the front and the back of your dog. Made from durable nylon fabric and lined with neoprene padding for extra comfort. Quick release buckles make it easy to put on and take off. If you already have an unstable dog, you need this to be easy. Adjustable straps provide a secure and custom fit. Grab handles on front and back allowing you to help support your dog in the area they need support the most. Harness can be worn while your dog goes to the bathroom. 100% satisfaction guarantee. If you are not satisfied for any reason, you can return for a full refund. Comfortable enough that you can leave the harness on during the day. Easy to put on and take off. An unstable dog is having problems standing, and if you have to lift your dog’s legs to get them strapped up, you are risking your dog falling when you are putting on and off the lift harness. Remain on while your dog goes to the bathroom. You may be surprised to realize that many harnesses have to be removed for your dog to go to the bathroom. That kind of defeats the purpose. Machine washable. Even with harnesses that can remain on while your dog goes to the bathroom, there may be some accidents on the lift harness. Adjustable straps. You don’t want to purchase a lift harness that is going to cause you to bend over the entire time in order to help your dog. This support harness is available in 4 sizes. Make sure to measure your dog’s chest size to insure a proper fit. The sizing chart is according to the manufacturer of this product. There are many dogs who can benefit from using a dog lifting harness. It is perfect for elderly dogs who have lost some of their mobility and aren’t as stable on their legs. 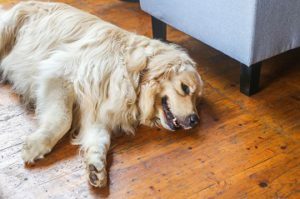 Also, benefits dogs with weak hind legs, orthopedic injuries, arthritis pain, hip dysplasia, joint pain and dogs that are temporarily disabled because of vestibular disease or vertigo. A dog lift harness isn’t just good for older dogs with health issues. It also a great temporary support for dogs who have recently had surgery or dogs with ACL tears. When I started looking for a lifting harness for dogs, I was looking for a rear dog lifting harness. My dog currently has vestibular disease or vertigo. The main problem I was trying to solve, was helping my dog from falling and stumbling. The biggest area my dog needs help is with his back end. The problem with every dog rear lift harness was that none of them would stay in place. Every single rear dog lifting harness needs you to hang on to the harness at all times or the harness slides down. I’m not sure about your dog, but my dog has never gone to the bathroom directly next to me. The T.U.S.H. dog harness allows you give your dog support when they need your help and lets you provide them some independence when your dog is able to be independent. The Top Dog Health harness will remain in place even if you are holding on to the harness. The most important considerations with a dog lift harness is helping your dog move around safely and ease of putting the lift harness on your dog. The freedom and happiness you will provide your dog to get outside, possibly go for a short walk and get some fresh air will make your dog happy and feel better. A dog lifting harness will help make it easier to get your dog to be able to move around and help them from falling. 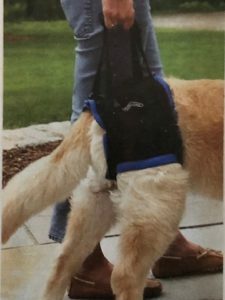 If you have a dog that is having problems walking or getting up, I believe that the dog lift harness review will help you see the benefits of using a lift harness and also see that the T.U.S.H. dog lift harness is a great option that is a smart choice for any dog owner whose dog needs some assistance getting up, walking or up and down the stairs. Hello Marla, your review on Dog lift harness is great. This article will be highly beneficial to those looking for such product for their dogs. It is interesting to know that older dogs that have lost mobility can make use of the dog lift harness as well as dogs that with weak hind legs. Thanks so much for teaching me how to take care of my dog in future especially in terms of having problems with mobility. Gracen I am glad you found the article beneficial. Even if you don’t have a dog in need of a lift harness at this time, it is still helpful to know what is available if the situation ever arises. I currently have a dog that is having issues. I now have a lift harness for him, but I wish I would have been prepared ahead of time. I knew it was coming, and we struggled for a few weeks before I was able to help him with the lift harness. Hi Marla, very interesting review about Dog Lift Harness. I actuall didn`t know that such products exist, dog harness is really helpful support for dogs with some disorders. I like the fact the product is 100% guaranteed satisfaction and that product is made from durable nylon lined with neoprene padding which makes good comfort for a dog using it. I like your review, thanks for sharing with us! Thanks for reading Luke. If you end up having a dog that is struggling with walking or getting up from the floor, a lift harness can be very helpful. It is hard watching a dog falling and having problems walking. A lift harness helps them to have more mobility.